A key to obtaining an ergonomic workstation starts with finding the right support for your feet. The UPLIFT Standing Desk Mat, 18" x 30" x 3/4", is a simple and affordable solution to office fatigue that will keep you standing in comfort. Gel foam interior supports your body and its textured surface gives you anti-slip protection you can appreciate while you work at your sit-stand desk. Enjoy a supportive mat that's there for you when and where you need it. It's also supremely easy to clean, just wipe down and you're good to go for more comfortable stand-up work. What do I do with the mat when I'm sitting? The UPLIFT Standing Desk Mat is light enough so that it can be easily slid out of the way when not in use. Will this mat still work with carpet? Yes, the UPLIFT Standing Desk Mat can be used on carpet or hard flooring! The Mat is super squishy and your feet will definitely thank you no matter what kind of flooring you have. Can this mat be easily moved out of the way? The bottom of the mat is smooth so that you can easily slide it out of the way. Can I roll my chair on top of the standing mat when I want to sit at my desk? We do not recommend rolling your chair on top of the mat as your chair may puncture the surface. It is light enough so that you can easily move it out of the way. Absolutely! The UPLIFT Standing Desk Mat is what we call an anti-fatigue mat. Its cushioned construction provides extra support when you are standing at your desk. Does this mat come in any other sizes or colors? The UPLIFT Standing Desk Mat comes in one size and color. Take a look at some larger anti-fatigue mats if this one isn't big enough for you. Yes, the surface of the mat won't soak up spills so it is easy to keep clean. Just take a damp rag and wipe it down from time to time! I got this as a free accessory with my order for a desk and treadmill. It would have never occurred to me that a person should spend $59 on a standing mat. Before I got this one, I might have considered spending $20. This mat is ridiculously comfortable. Without this mat, I would be standing half as much at my new desk. Invite a friend to stand on it, and they'll say "oooh nice." Not only that, I got the Uplift motion stool with the round base, and I am protecting my treadmill belt by putting the stool on the mat when I sit - so I feel like I am abusing this mat pretty seriously, but it seems to be holding up really well. It shows a pattern of indentation from the pattern on the stool base, but it's not crushing or tearing or disintegrating. It's also very light, so it's easy to flip aside when I want to turn the treadmill on. I would say this is an essential accessory for a standing desk. 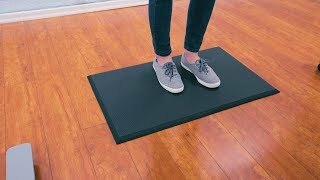 I've stood on several different anti-fatigue mats and this one by far offers the best support and comfort of any I've ever used. I use my standing desk as a composing workstation. This mat came as a freebie with my desk. While I haven't used it to stand on, I have found it to be a fantastic solution for keeping synth control pedals where I want them. I've always been plagued by pedals that slide away and this mat keeps them right where I want them. We just ordered some of these to go with our standing desks, they are so cushy on your feet a must have if you are standing! Received my Desk Mat today. Feels very nice on my bare feet (with or without stockings). Also feels good with the running shoes I usually wear but the material of this mat is a lot more comfortable than my actual shoes (which are pretty comfortable to start with). I spent a bit of time considering other mats before purchasing this one. The others were pricier and had dimensions that were less sensible. If you're buying an Uplift Desk, order this at the same time to save a bit on the shipping. Quite happy with this mat. Using it on an oak floor. Guessing it would work well on concrete too, but that's a lot harder than most wooden floors. Not sure if this would make sense for carpeted floors. This pad (or something that performs equally well) really is a necessity for a standing desk. BTW - I was originally considering the other mat that Human Solution sells. Someone on the chat line said this was the better way to go (though half the price). Said the thicker pad actually has a quarter-inch 'chair proof'' covering that can detract from its cushiness. Cons: Could have saved on the shipping if I had bought it at the same time as my Uplift Desk legs. Wish I had bought this instead of the far less comfortable and thinner 'Joe' mat I ordered.